The Indian Head Penny is a one cent coin that was produced by the United States Mint from 1859 through 1909. On the front of the coin, Liberty is depicted as a Native American wearing a feather head dress with the word "LIBERTY" on it. 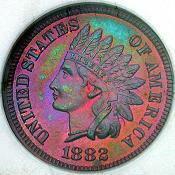 The words "UNITED STATES OF AMERICA", and the date also appear on the front of the Indian Head Cent. For the first year, the reverse had the words "ONE CENT" inside a laurel wreath. In 1860 this was changed to an oak wreath with a small shield. The Indian Head Pennies were made up of 88% copper and 12% nickel from 1859 to 1864. Then in 1864 they began making them of bronze which is 95% copper and 5% tin and zinc. The weight of the coins was also reduced. The early Indian Head Cents also went by the nickname "Nick" or nickel. This was before there was such a thing as the nickel 5 cent coin we know today. They were given that name because of the nickel they contained. The Indian Head Pennies lost their nickname in 1866 when five cent nickel coins were produced. 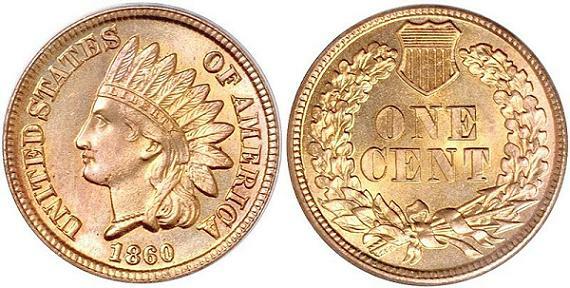 It has been rumored that the model for the Indian likeness was the daughter of James Barton Longacre who designed the Indian Head Penny, but it has not been proven. In 1908 the Indian Head Penny was produced at the San Francisco Mint. This was the first time that one cent coins were minted anywhere but the Philadelphia Mint. The Indian Pennies produced at the San Francisco mint have the "S" mint mark. The coins minted in Philadelphia, however, do not have any identifying mint marks. An Indian Head Penny with and "S" mint mark is somewhat scarce, hence they are more valuable than other Indian Head Cents. The Denver Mint did not see one cent coin production until 1911. During the Civil War, almost all gold and silver coins disappeared from circulation. Eventually the copper-nickel coins also became scarce. Merchants in larger cities began to issue their own copper tokens so that they would have change for their customers. The government stepped in in 1864 and began issuing its own thin bronze one cent coin. They also made the merchant's tokens illegal.